Built on the waters edge with its own jetty and small sandy beach, Snapper Lodge is the ultimate romantic private hideaway set behind a stand of bamboo and under a canopy of established trees. Styled and lovingly nurtured by an artist this rustic beach house is not only a retreat for lovers, it is a unique bohemian gem of creativity. 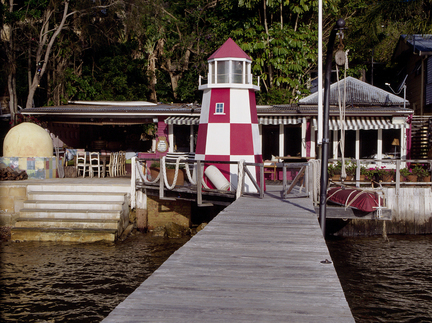 You may experience deja vu as you enter through the colourful lime-washed doors, as this1950's converted boat house has seduced fashionistas and style gurus and has featured in several leading design and fashion magazines. Enjoying all the afternoon sun and beautiful sunsets over Pittwater's shimmering waters, the open plan layout with a king size bed, lounge, kitchen and bathroom also boasts a second bedroom and bathroom - set in separate private pavilions. The atmosphere is Mediterranean with the colour tones of Morocco and Mykonos, yet Snapper Lodge is only 45 minutes from Sydney's CBD.